There is another proposed bill facing the Alabama Legislature this year and it is AL HB-45 entitled: The Alabama Religious Freedom Amendment sponsored by State Representative Bridges. The title of the bill alone should cause pause. There is some background history to this bill being introduced that needs to be brought into the foreground. History that this bill conveniently ignores. In 1992, Roy Moore was appointed as judge by Gov. Hunt to the Etowah County Circuit Court. As soon as he took office as judge, he placed on the walls of his courtroom a wooden engraving of the Ten Commandments. He also opened each court proceeding with a prayer that the jury would seek divine guidance in the deliberations of the trial. The ACLU sued stating that the presence of the Ten Commandments and pre-session prayer were unconstitutional. Initially Roy Moore lost the case and was ordered to remove the wooden plaque and to stop the pre-session prayers. There was a stay on the decision and an appeal was made but the court never ruled on the appeal, throwing it out on technicalities. The plaque remained and presumably the prayers continued. In 1999, Moore ran for Chief Justice on the platform that Alabama must return “God to our public life and restore the moral foundation of our law.” He won election. Shortly there after he began plans to have made a 5K plus pound granite structure that would have inscribed on it various quotes from founders of the nation topped with the Ten Commandments chiseled into tablets. Moore was removed from office in 2003. In 2012, Moore was re-elected to the role of Chief Justice. This amendment is clearly an attempt to allow Chief Justice Moore to reinstate his monolith in the Alabama Supreme Court building in full violation of separation of church and state as he promised he would do if re-elected to office. 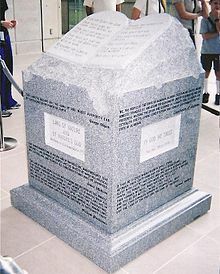 In fact the amendment describes the monument in how the Ten Commandments could be displayed. The fact that the Ten Commandments represents a specific religious background–namely the Abrahamic Faiths of Judaism and Christianity this establishes a state religion in the Judeo-Christian tradition. Could the tenets of Sharia Law be posted on public grounds? No. Could there be a plaque of the Unitarian Universalists’ Seven Principles posted? No. What about the Wiccan’s creed? No. The Dao? No. This bill, if passed, would come up for vote in a general election. We must not let such discriminatory and preferential language be added to our state constitution. This amendment moves Alabama closer to being a theocracy than a democracy. We cannot allow our religious freedoms to be so narrowly defined under the Judeo-Christian rubric as this amendment would do. Nothing like the pre-filing of bad legislation in the State Assembly to awaken this blog from its slumber. I have not yet reviewed all of the pre-filed legislation but a few caught my eye as a clergy person. The house and the senate have pre-filed the “traditional winter celebration” act as HB-15 and SB-18. The bills, identical wording in both houses is sponsored by State Representative Weaver, State Senators Allen, Fielding, Hightower, Marsh, Waggoner, Glover, Reed and Orr. This act would “allow school district[s] to educate students about traditional winter celebrations and offer traditional greetings.” The word “traditional” is code for Judeo-Christian religions. This act would allow three greetings to be used in schools, including but not limited to 1) Merry Christmas 2) Happy Hannakuh 3) Happy Holidays. This act would also allow for displays on school property of “traditional winter celebrations” as long as such display includes more than one religion and/or there is a secular display as well. The “traditional winter” displays cannot encourage people to adopt the religion expressed. My concern isn’t the display of religious paraphernalia on public property. There is nothing more Unitarian than the celebration of Christmas. The conservative Protestant Christians had outlawed the celebration of Christmas until 1681. And then it was not until the Unitarians of the early 19th century began celebrating Christmas in Boston that Christmas began to gain popularity. Prior to that Christmas Trees were not used much in the States nor was Saint Nicholas visiting them. The conservative Christians were opposed to such distractions of merriment and good cheer. Yes, if you want to blame who put Christ back into Christmas it was those liberal Unitarians in the early 19th century who revived Christmas celebrations from Europe. They wrote the hymns that many cherish today as “traditional winter celebration” songs: I Heard the Bells on Christmas Day, It Came Upon a Midnight Clear, and Jingle Bells. My concern is with the term “traditional.” Alabama is increasingly becoming a state with many religions celebrated. What defines “traditional”? Is celebrating the Winter Solstice a traditional winter celebration in Alabama? Is Kwanzaa that celebrates African culture and values a traditional winter celebration in Alabama? Is Pancha Ganapati, the Hindu festival, considered a traditional winter celebration in Alabama? Is Dōngzhì Festival, a solstice celebration of Chinese and other East Asians, considered a traditional winter celebration in Alabama? What about Eid-al-Adha, the Muslim commemoration of Ibrahim’s willingness to sacrifice his son? Is Las Pasadas considered a traditional winter celebration in Alabama and therefore taught in our schools? It is Christian but it is celebrated in our Latino immigrant communities. Alabama has not been kind to its immigrants. Will Alabama value their religious traditions enough to recognize them as “traditional winter celebrations”? Will any of the religious observances I mentioned above be taught in our schools? Some of these celebrations are relatively new in their creation like Kwanzaa and Pancha Ganapati but they are winter celebrations nonetheless. Kwanzaa was created to instill pride in being African American and to counter the microaggression of white privilege on their children. Pancha Ganapati was created to counter the Christian micro-aggressions felt by Hindu children. In my tradition of Unitarian Universalism there is the recent creation of Chalica; created as a winter celebration again, in part to counter the Christian micro-aggressions felt by our children from the culture in which we live. So would these winter celebrations not be allowed to be taught because they are, in the history of religions, relatively new? I find this bill to be an attempt towards codifying Christianity as the State Religion. It is a means to let the rest of Alabama, those who do not share the “traditional” religion of the state, that Christianity is the respected and correct faith of the State. Focusing on the “traditional” elevates the esteem of those who follow the “traditional” faith and it demeans those who do not follow that faith simply by the absence of teaching about them. If on the other hand, all of these winter celebrations were to be taught and not just the Christian celebrations, then this act could be seen as an attempt at teaching multi-cultural appreciation which would strengthen Alabama’s acceptance of people whose cultural and religious backgrounds are different than the “traditional”. But I suspect this is not the case. That would be too liberal for this State Legislature to even imagine.